The discount retailer has announced a new strategy to expand its product offering and also start stocking items above the £1 price tag by introducing a multi-price point range across its UK stores. Steinhoff International, which acquired Poundland last year, said it “remained excited” about the general merchandise retail business, adding that it was “trading ahead of expectations”. Reporting its results for the half year ended March 31, 2017, Steinhoff, which also operates Bensons for Beds and Harveys Furniture, said Poundland had experienced positive like-for-like sales experienced in the first quarter, which continued into the second quarter (the first positive like-for-like growth since December 2014). The parent firm added that UK operations have now gained significant scale and good progress has been made with results exceeding that of the Poundland acquisition plan. Plans to move away from a single-price point in Poundland were revealed as one of the areas of focus in the retail group’s strategy going forward. Other areas include the expansion of product ranges to include clothing; optimisation of the store network; and collaboration with the greater Steinhoff group on supply chain initiatives. The closure of 57 loss-making stores in the Poundland portfolio during the period “should have a positive impact on profitability going forward”. Furthermore, during the second quarter, the roll-out of Pep&Co store-in-store concepts within Poundland stores was introduced. The first phase was completed in May. In addition, GHM! 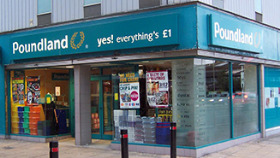 stores were converted to Poundland stores, while Pep&Co standalone stores reported good sales growth. Steinhoff’s UK results for the half took a knock due to deflation. UK operations reported a 19% decline in revenue to €325 million, largely due to a 14% devaluation of the pound. Revenue in constant currency declined by 6%, which the retail group said was impacted by “a challenging post-Brexit trading environment and store closures”. However, like-for-like sales were down by only 2%. Margin in this territory increased by 60 basis points, driven by a resilient bedding market combined with the group’s long-term strategy of “optimising and reducing the size of the store estate”.